A new, pre-skin care step for visible pigmentation. It is an evanescent, aqueous lotion denser than water and more fluid than a serum. 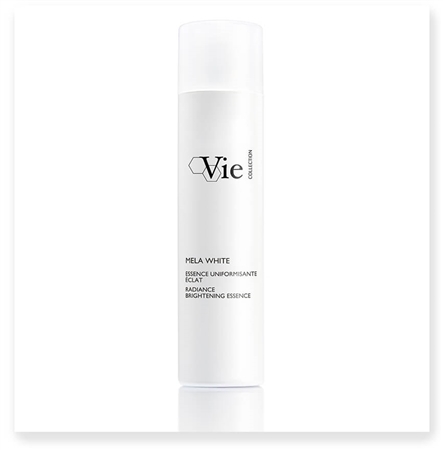 A truly refreshing, slightly astringent "splash," MELA WHITE leaves skin with a very soft, velvety-smooth finish. A light scent of fresh floral notes including jasmine and rose. GLABRIDIN :inhibits melanin synthesis by inhibiting two key enzymes: TYROSINASE and DOPAchrome Tautomerase to stop pigmentary cascade and the production of melanin. *Visible scoring of volunteers after twice-daily application for 8 weeks, evaluation on whitening effect by chromametric analysis and satisfaction tested after twice daily use for 8 weeks.